This year, the North American Wetlands Conservation Council funded five projects within the PLJV region to receive North American Wetlands Conservation Act (NAWCA) grants. Together, these five projects will provide $1.4 million in federal funds and another $2,206,303 in matching funds to support long-term wetland acquisition, restoration, and enhancement of more than 13,126 acres, benefiting many species of migratory birds and other wildlife. This standard grant project is a continuation of the success of the three previous recent Standard NAWCA grants in Kansas from Ducks Unlimited. 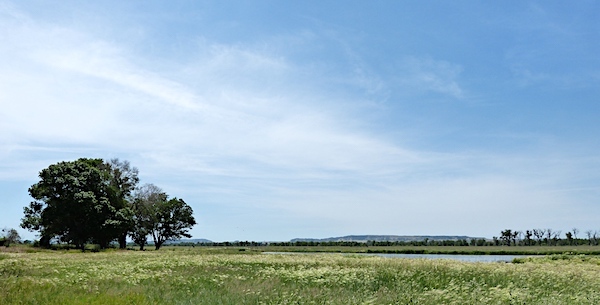 The grant capitalizes on and continues the multi-partner effort (including Kansas Department of Wildlife, Parks, and Tourism and Kansas Alliance for Wetlands and Streams) to initiate a large-scale private wetlands restoration effort across Kansas. In addition to playas, wetland conservation will occur on several important wetland complexes that are identified as areas of significance to North American waterfowl and other wetland birds. Based on a landscape-level approach, these projects will provide critical links between Prairie Pothole breeding areas and wintering habitats. Located at approximately the same latitude in the Central Flyway, the wetlands in this proposal provide critical migration stopover habitat for waterfowl, shorebirds, wading birds and many other migratory birds. The North Platte River provides critical habitat to millions of migratory birds and is the focus of a multi-partner effort which includes Ducks Unlimited, Platte River Basin Environments, Nebraska Game and Parks Commission, and many others. The Dry Spotted Tail Creek Wetland Restoration project (pictured above) represents the next phase in an ongoing effort along the North Platte River to restore and perpetually protect vital wetland habitat in this continentally important landscape. This project will restore 180 acres of wet meadow and stream channel in the historic floodplain of the North Platte River. Ducks Unlimited and Texas Parks and Wildlife Department will protect and restore 170 acres of playa wetlands and uplands within the Texas Panhandle. The grant funding will help complete a fee-title acquisition of approximately 150 acres consisting of a playa wetland and surrounding uplands. Prospective properties will be chosen based on the highest value to waterfowl and other wetland birds according to foraging habitat value of the playa, frequency of playa wetness, and proximity to other potential foraging habitat. In addition to the acquisition, partners will restore a 20 acre playa by backfilling a pit in a previously excavated playa basin. Eight partners, including the New Mexico Land Conservancy and the US Fish and Wildlife Service, are working together to protect in perpetuity 5,739 acres via two conservation easements within the 96,000-acre Fort Union Ranch within the Rio Mora watershed. A donated conservation easement of 2,539 acres will match the protection of 2,910 prairie and 290 wetland and acres through a new conservation easement, restoring 34 acres of emergent wetlands of a playa and a saline lake through invasive species removal and in-stream restoration on 1.5 miles of Wolf Creek running through the new easement. An additional 190 acres will be excluded from grazing along Wolf Creek to manage grazing and improve the quality and quantity of emergent wetlands for waterfowl and riparian obligates. The Texas Playa Conservation Initiative is a seven-partner conservation effort, led by Texas Parks and Wildlife Department, created to restore playa wetlands in the Texas Panhandle. Historically, pits were dug to collect water within playas for use in surrounding cropland irrigation or to provide livestock watering sites. Placing a deep pit into a shallow playa basin alters the hydrology of the wetland. With combined funds under this grant, the partnership anticipates restoring 650 wetland acres, which will provide benefit to an additional 650 upland acres. The goal of the project is to increase playa productivity for migrating and wintering waterfowl, shorebirds, and other wetland dependent birds and to help in the recharge of the Ogallala Aquifer for area producers.